Before you purchase a system, it is important to ensure that it is capable of providing an effective solution to each of your identified goals. A solution is a problem solved. Our decades of industry experience has taught us that every client has two fundamental problems that must be solved – how to capture the documents and data to be managed and how the documents and data are stored, indexed, and secured for later retrieval and use. Evaluating the efficiency of the solutions provided by competing products constitutes the primary cost-benefit analysis that must occur during system acquisition. How much labor will be involved in document capture? How much labor is required to perform data entry? Over its lifetime, the cost of a system is typically secondary compared to the labor involved in its day-to-day operation, so it is important to know exactly how much labor each system can save while meeting the two fundamental challenges of capture and indexing. The sections below describe exactly how Optix meets these challenges. Documents can be either physical or electronic. Physical documents can be expressed on paper, microfilm, photographs, or any other physical medium. Electronic documents are typical desktop files such as MS Word, Excel spreadsheets, digital photographs, or other files created by computer applications. A good capture solution should be able to easily handle either type of document. An Optix Capture Task provides the “on-ramp” for both physical and electronic documents – physical documents are scanned and electronic files may be input using drag and drop. The Capture Task can then perform sophisticated data extraction, operator interaction, run custom scripts, and perform storage to managed, secure, server-based repositories, workflows, or folders as well as disposition to other destinations such as FTP folders, print, fax, or email. Scanned documents may be captured as multipage TIFF, PDF, or Collections. Dropped files maintain their original format. A new custom Capture Task can be easily created, specified, and stored in seconds on our Optix Workstation for Windows or Optix Workstation for Macintosh. The steps to be performed by the task are specified by dragging and dropping predefined instructions from the Optix Task Item Palette. These instructions represent processing steps such as how the document will be scanned, the metadata to be extracted, form recognition and processing, and the target repository or workflow to which the document will be stored. 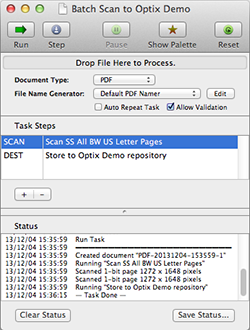 The capture operator can run the task to input as many documents as desired. Assuming that the extracted metadata is assigned to target database indexing fields and that the assigned data passes validation, it is entirely possible to construct a Capture Task that inputs a scanner hopper full of multipage documents and indexes and stores them to the server automatically – all with a single click. Consider the labor-saving power this can bring to your document capture operation. Read more about how easy it is to create and use Capture Tasks here. The Optix Application Generator interacts with the Optix Server to define and create indexed repositories, workflows, and folders. This application typically requires system administrator privileges to add new items or make modifications. The Optix Application Generator is most often used to define a new database table to index a specific type or class of document. The records in the database table along with the documents associated with the records are referred to as a repository. Tables may be defined for use both with and without associated documents. 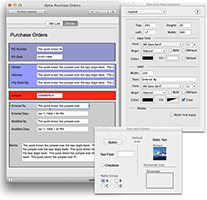 In addition to specifying the new table name and fields (field names and field types) for the new table, the Optix Application Generator allows the administrator to quickly and easily design the graphical user interface presented to users when indexing new documents or performing queries. 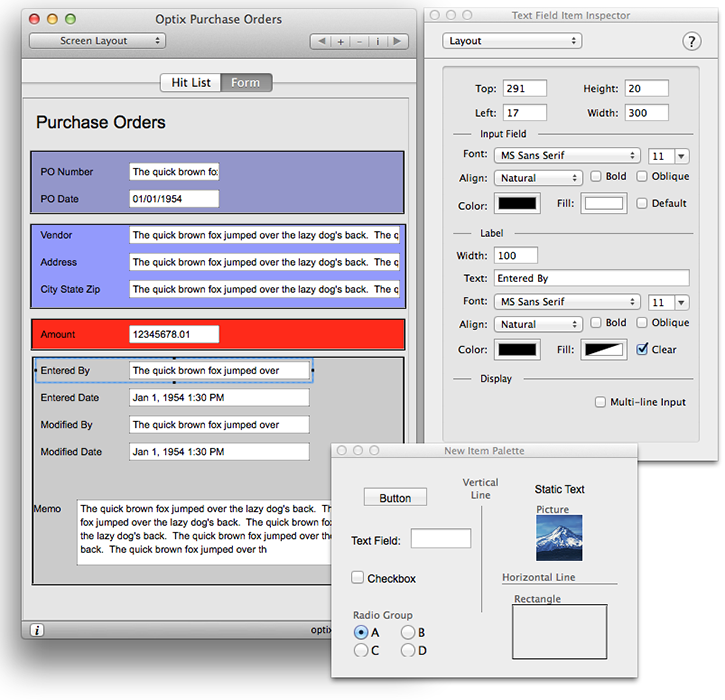 All visual aspects of the interface may be specified including position of the fields on screen, the size, color, font, and style of text used as well as the background color of the window. The entire table, field, and user interface specification is stored in an XML-based definition file. Once ready for deployment, the administrator (from within the Optix Application Generator) logs onto the Optix Server and elects to upload the definition, specifying the security for the screen. Only end users with specified privileges will be able to see and access the repository. This allows the administrator to quickly and easily create repositories for each department in a company, specifying exactly which users can add new documents or find and retrieve existing documents. In addition to creating new repositories, the Optix Application Generator can define and deploy new Workflows (requires optional Optix Workflow server module). 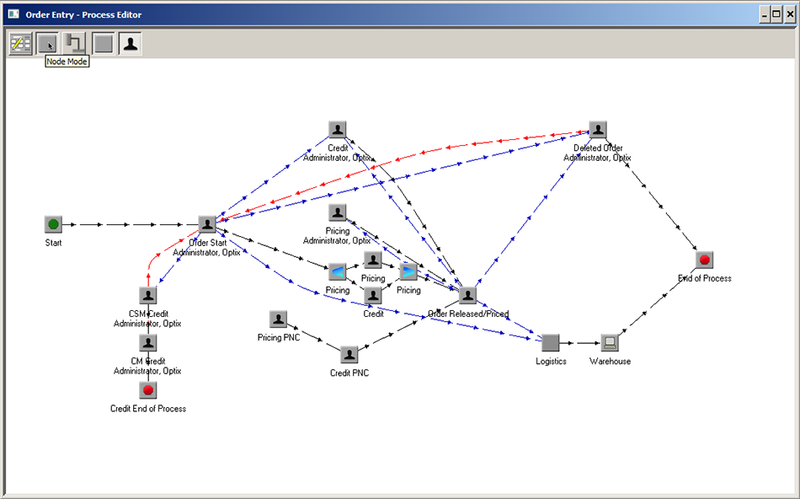 It is important to note that whether you are creating a new indexed repository or deploying a new workflow to automate your business practices, it can all be accomplished using the Optix Application Generator – the Optix Server takes the screen or workflow definition and interacts with the underlying RDBMS to create the database tables that power your design – no programming required. The ease and speed with which you can deploy new applications will allow you to quickly extend the benefits of Optix document management and workflow throughout your organization. Read more about the Optix Application Generator here.